NBC Bay Area investigates whether community ultrasound screenings are worth the time and money, and -- most importantly -- if they lead to better health. Flyers advertising all kinds of services land in mailboxes every day, but one in particular caught the attention of an NBC Bay Area News Producer. It featured a grandmother of five who credited a stroke screening ultrasound for saving her life. It's a dramatic statement used in advertisements from Life Line Screening, a company that sets up thousands of mobile screening services at churches and community centers all across the country. A stroke is a serious and scary condition no doubt, but many doctors, including Dr. Enoch Choi, a Bay Area urgent care physician question whether these mass screenings do more harm than good. Dr. Choi says, "I really worry that these kind of companies are really exploiting the fears of people. Life Line Screening advertises five screenings for $149. For that, you get ultrasounds of your carotid arteries, abdominal aorta, legs, and heel, as well as an EKG to check for irregular heartbeats. Three weeks later, you get your results. According to government reports, these types of ultrasounds can have a high rate of false positives, which can lead to potential potentially harmful additional tests, and that worries Dr. Choi who says, “The additional tests that need to be done to see if there's a real problem, those often times are more invasive, and they can have side effects even if they're rare. Why subject yourself to the possibility of having these terrible side effects if you didn't have to do it in the first place?" The high number of false positives is one of the main reasons the U.S Preventive Task Force, which is part of the Department of Health and Human Services, does not recommend these screenings for most adults. We talked to the Chief Medical Officer of Life Line; Dr. Andy Manganaro, who is just as critical of the agency's recommendation. Dr. Manganaro says the information the USPTF used is out of date, and he goes on to say, “The negative characterization associated with the USTPF report really why they may have been pertinent at the time, are really no longer pertinent, and many weren't pertinent at that time, so that's why we disagree with the USPTF.” Dr. Manganaro also says the screenings can detect problems, which often times have no symptoms. It's not just the USPTF against these mass screenings. 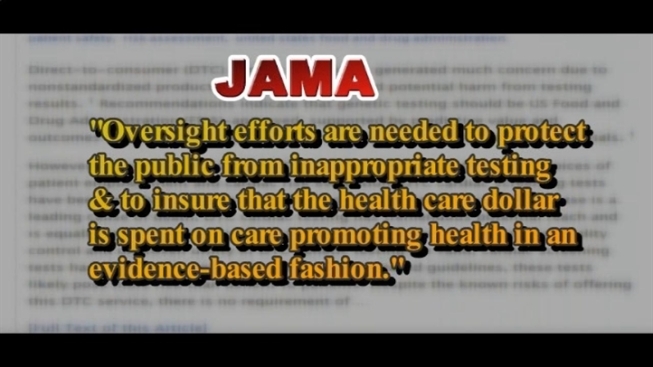 In June, a commentary was published in the Journal of the American Medical Association saying oversight is needed. Still, some doctors are still recommending these screenings for their patients, including Pete Lunardi’s doctor. We talked to him right after he came out of a Life Line Screening at a Danville church. He says, "When we got the flyer in the mail, I checked with my doctor, and he thought it was a good idea. He said they do a good job." That recommendation surprises Dr. Choi, who says, "I can't believe that local physicians are saying that you need to do this because every physician organization that I’ve read are saying those are really not helpful." Dr. Choi is not against these screenings in general, he just wants to make sure only the people who really need it get them. He says, "If you have enough risk, if your physical examination shows that there's a possible problem, many of these tests that you can obtain at these screenings, I do on a regular basis at my urgent care practice." Many people we talked to at a recent screening, it comes down to affordability and convenience. Judi Franich said, “I paid $128 for the three tests I got done today, and it just gives me peace of mind. My time is worth $128 dollars to say nothing about having to go back three times and set appointments.” That’s why she says she’s likely to return, adding to the six million health screenings the company says it has performed since 1993. There are plenty of online resources for stroke prevention, including the National Institute of Neurological Disorders and Strokes.